Manila, Philippines - San Mig Coffee Mixers overtakes Rain or Shine (ROS), 77-76, in Game 3 to grab 2-1 lead in the 2014 PLDT MyDSL Philippine Cup on Wednesday, February 19, 2014 at the Smart Araneta Coliseum in Cubao. "That was a really tough one to be a part of," Mixers head coach Tim Cone said after the game. "Really shaking right now." Elast Painters threated to break away in the first half, but San Mig Coffee ended the second period on an 8-0 run to cut the ROS lead to a single point, 39-38. 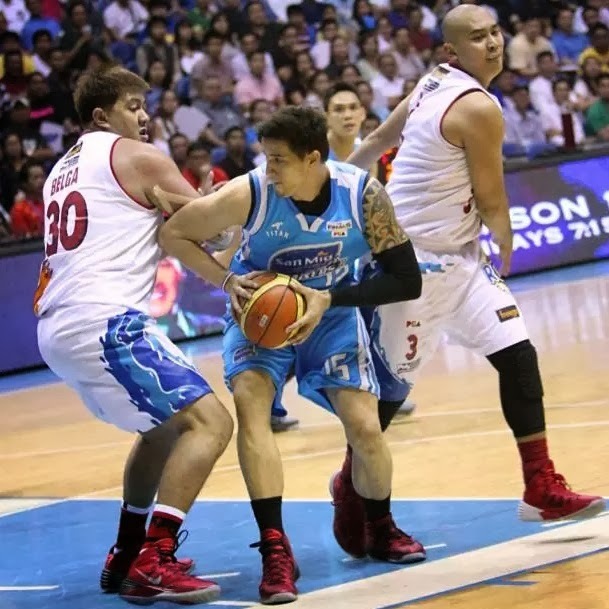 James Yap, who was in foul trouble early in the game, took over for San Mig in the third quarter, going on a 6-0 solo blitz to knock on Rain or Shine's doors, 54-52. Peter June Simon led San Mig Coffee with 14 points, while Devance continued his fine performance in the series, finishing with 13 points, nine rebounds, and four assists. Game 4 of their best-of-seven series is set on Friday, 8 p.m. also at the Big Dome with Live broadcast on TV5.